Copyright 1980 LORIMAR PRODUCTIONS, INC.
" You are your favorite character! 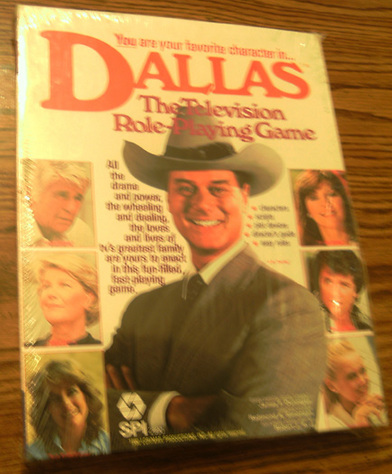 characters from the television show, Dallas! You even direct the episode! In each game, one player assumes the role of the Director. to achieve individual goals defined by the Director. You control the minor characters! by its own card, to be sought or avoided by your own major character. can be deadly in an opponent's hands. Create your own scripts or use ours! original episode that will be interesting, unpredictable, and exciting. " This game is still in its original shrinkwrapped package, but there are some tears in the plastic along one side due to handling. It has never been opened.